Tiger Treats - Ruth Plumly Thompson's "Trojan War"
Author of The Giant Horse of Oz, The Wishing Horse of Oz, King Kojo, etc. The Trojan War really started with a wedding, the wedding of a sea nymph and a mortal. And it all goes back to those old golden days when sea nymphs thought nothing of coming ashore and when even the most important of the gods living on Mount Olympus descended now and then in their flaming chariots to mix in the affairs of mere mortals below. These gods and goddesses, like the fairies in our own legends, were sometimes good, sometimes evil, and it was a bad fairy, Eris, Goddess of Discord, who caused all the trouble. Not receiving an invitation to the wedding of the sea nymph, Thetis, and the mortal king, Peleus, this sulky goddess revenged herself upon the merrymakers by tossing a golden apple among the guests. On the apple were the words: "For the fairest." And in a company where all were acknowledged beauties, you can imagine the jealousy and vexation that followed. After a lively controversy, the choice narrowed down to the three loveliest daughters of the gods - Minerva, Goddess of Wisdom; Juno, wife of Jupiter; and Venus, Goddess of Love and Beauty. Jupiter, though himself the highest and most powerful god on Olympus, hesitated to settle so delicate a question. So he sent the three beauties to Mount Ida, which is in Asia Minor near Troy. Here upon the mountainside, Paris, a handsome young shepherd, was tending his flocks, and upon Paris fell the responsibility for awarding the golden trophy, well called the "apple of discord." Naturally, each of the immortal maidens was desirous of being judged the fairest, so Juno promised Paris riches and power; Minerva, glory and renown in battle, but Venus promised him the most beautiful woman in the world. And perhaps because he wanted the most beautiful mortal more than he wanted riches or glory, or perhaps because he really considered her the fairest, Paris gave Venus the golden apple. Disappointed and furious, Minerva and Juno swept back to their cloudy castles on Olympus and from that day on, did all in their power to thwart and injure the young judge who had decided against them. Venus, on the other hand, became the champion of Paris and, following the advice of this mischievous goddess, Paris, who was not really a shepherd, but the son of King Priam of Troy, set sail for Greece. Arriving after a perilous voyage at the court of Menelaus, King of Sparta, the young prince was kindly received and entertained by this generous monarch. But it was not the king whom Paris had come to see. It was Helen, wife of Menelaus - Helen, the loveliest and fairest of mortals, chosen by Venus as Paris' reward for giving her the golden apple. Knowing Venus would always help him and, made bold by her friendship, Paris, under cover of darkness, carried Helen down to his ship and sailed back to Troy, thus evilly repaying Menelaus for his hospitality. Enraged at such treachery, the Spartan king called upon all the Grecian chiefs and rulers to help him, determined at any cost to recover his wife from the scheming Trojan. So it was that the golden apple flung by a vengeful goddess at the wedding feast of Thetis started a war that lasted ten long years, a war engaging all the kings, princes and heroes of those ancient and exciting days when men fought hand to hand with arrows, swords, spears and javelins; when ships depended on wind, sail and oar, and bravery was a grand, glorious and very personal matter. Responding to the call of Menelaus, the powerful chiefs and rulers banded together to help him recover the beautiful Greek, Helen. It took two years to assemble the warriors and to prepare the ships to carry the great army to the coast of Troy. Agamemnon, King of Mycenae and brother of Menelaus, was chosen commander of the combined forces, and Achilles, mortal son of Thetis, the sea nymph, was the bravest of the warriors, so powerful none could lift his sword. With Achilles came Patroclus, and almost equal to the illustrious son of the sea nymph was Diomedes. Another celebrated fighter was Ajax the Greater, renowned for his strength and courage, and Ajax the Less, with his forty ships and his legion of lusty followers. Nestor was the oldest and wisest of the Greek kings, as mighty in battle as he was sage in counsel, while next to him in wisdom ranked Ulysses, King of Ithaca, noted for his cleverness and his eloquence. Calchas was the seer and prophet of the Greek army, and there were, besides these, so many other famous heroes and princes a list of their names would stretch from here to the skyline. Each of the kings and chieftains brought his own men and ships, and when I tell you that there were gathered in the Port of Aulis more than a thousand vessels, each carrying from a hundred to a hundred and fifty men, you will realize what a great company set sail for Troy. I should like to have been a boy or girl watching from some Grecian hill as that mighty navy swept out into the blue Aegean. Those strange, high-prowed ships with the tall, black-bearded kings pacing the decks, those stalwart warriors bending to the huge oaken oars, must have been a sight to make the heart beat fast, the neighs of the war horses mingling with the farewells of the heroes as the many colored sails filled, lifted and carried the fleet majestically out to sea. Word of the oncoming host had already reached King Priam in his ancient, towered city, so he, too, called in his allies and prepared for war. And Troy was not without its valiant fighters and princes. The most famous defender of the walled city was Hector, oldest son of King Priam. Unlike Paris, his vain and willful brother, Hector combined in his character all the best qualities of a prince and warrior. Without excusing the stealing of Helen by Paris, the wicked act that was to plunge his father's kingdom into a long, ruinous war; Hector threw himself wholeheartedly into the plans for the defense of Troy. With him were Aeneas, Sarpedon, Deiphobus and Glaucus, all martial princes of heroic size and courage, besides a countless and unremembered host of foot soldiers. Gathered in the walled city, they made ready to meet the allied armies of the Greek kings. After many months, many delays, many mischances and mishaps, the fleet of the invaders dropped anchor off the coast of the Asian City. Surging from the ships, the armed legions rolled in menacing waves across the plains before Troy. But the Greeks were met with a determined and furious resistance. This war was not to be decided in one, two or even twenty battles. Realizing this, the invaders set up their tents on the shore beside their ships and settled down for a long and bitter siege. For nine long and terrible years the two armies contended for supremacy, so that the plains between Troy and the fleet were torn up and trampled by the constant thunder of the battling men and chariots. Dwellers in the outlying villages and towns grew accustomed to the blare of trumpets, the clash of armor and the windy neighing of the war horses. Strong as were the forces of the Greeks, the walls of Troy were still stronger, holding firm under each tumultuous charge and attack. After issuing forth to harass the enemy, the Trojans could always retire to their embattled towers, so it is small wonder that many of the Grecian chiefs and leaders wearied of the siege and longed to return to their own homes and families. But they were too proud to admit defeat and so, with sometimes gains for one side and sometimes gains for the other, the weary fighting continued. During all these years Helen lived in the palace of Priam with Paris, and in all the battles Venus helped the Trojans. Juno and Minerva, sworn enemies of Paris, supported the Greeks, and Jupiter, who had mortal sons on both sides, assisted first one army and then the other. But the help and interference of the Gods only served to prolong the war and did more mischief than good. In the ninth year of the contest, a quarrel between Achilles and Agamemnon, the two greatest chiefs and warriors of the invading forces, almost brought defeat to the Grecian army. In the course of the war many villages had been conquered by the Greeks, and Achilles, claiming an unfair division of the captives and treasure, retired to his tents, withdrawing his forces and refusing to have anything more to do with the fighting. Nestor and Ulysses tried to settle the difficulty between the chiefs, but Agamemnon refused to give up any of his treasure or make any new division of the captives, so Achilles refused to have anything more to do with the leader of the expedition. As Achilles was the most brilliant and inspiring leader on the Greek side, his retirement had a far-reaching and very dispiriting effect on the men in the ranks. Exhausted by the long, profitless years of fighting, they clamored for their chieftains to leave the scene of carnage and bloodshed and return to Greece. But Agamemnon refused to listen to their pleas and, determined to prove that he could manage the war quite as well without Achilles as with that dauntless warrior, he launched a new attack upon the Trojan forces. As the two armies were drawn up for battle, the plumes of the helmeted warriors waving in the wind, their spears and brazen shields flashing in the sun - chariots pressing close to the heels of the foot soldiers, trumpeters and couriers preceding the heroes - Hector stepped fearlessly out between the lines. Scorning the shower of stones and Grecian spears, he proposed a single combat between Menelaus and Paris to end the war, the victor to retain fair Helen and the army of the winner to be declared victorious. Eagerly Helen's husband, the Spartan king, agreed to the terms and, thirsting for revenge upon the treacherous Trojan, quickly sprang forward. Paris, dazzling in his jeweled armor, with a leopard skin flung over one shoulder, stepped out to defend himself, and the two armies, drawing back a pace, prepared to watch the contest. SYNOPSIS: Because Paris, son of King Priam of Troy, stole Helen, wife of Menelaus, King of Sparta, carrying her back to his father's Asian city, Menelaus declared war on King Priam. All the powerful rulers and warriors of Greece came to Menelaus' assistance and, gathering their armies' and ships, set sail for Troy. But so strong were the walls and battlements of Troy and so brave its heroic defenders, even after a nine years' war the beleaguered city had not been captured nor Helen restored to her husband. Before one of the countless battles, Hector, another son of King Priam, proposed that Paris and King Menelaus meet in single combat to end the war, the winner to receive fair Helen and the army of the winner to be declared victorious. To this, Helen's husband eagerly agreed and, both heroes stepping forward, the two armies withdrew to watch. It soon became apparent that Menelaus would win. But, alas, the long war was not so easily to be decided. At the moment when victory for Menelaus was assured, Venus snatched the young Prince away in a cloud and carried him safely back to the palace of Priam. Indignant and furious, the Spartan king called for Paris to return and finish the fight, while Agamemnon, Commander of the Greek armies, rising in wrath and majesty, demanded that the Trojans make their promise and return Helen to her husband. In the ensuing confusion an arrow wounded Menelaus, and the truce being broken, the two armies rushed upon each other with renewed bitterness and fury. At the height of the engagement, Hector, shamed by the cowardly retreat of his brother, challenged one of the Greek Princes to single combat. The Greeks drew lots and the great honor of defending his countrymen fell to Ajax. And so without any personal hatred or rancor, these two heroes fought a spirited duel with sword, spear and javelin. Night fell without either gaining a victory, and so brave did each consider the other, they exchanged rich presents to commemorate their meeting. Meanwhile, Priam tried to persuade Paris to give up the beautiful Greek Queen, but the stubborn Prince refused, agreeing, however, to return her riches and treasure to the Greeks. But the Greeks refused to accept the treasure without Helen herself, and after granting a short truce for the burial of the dead on both sides the fighting continued. During the truce, the Greeks, fearful for the safety of their ships; erected a mighty breastwork around the fleet and to these fortifications they were driven by the next rush of the Trojans. Without Achilles, who was still sulking in his tent because of his quarrel with Agamemnon, it seemed impossible to resist the attacks of the enemy under the leadership of Hector. Fearing ultimate defeat, the Grecian Chiefs persuaded Agamemnon to send a message to their mightiest warrior. Ulysses and Ajax were chosen for this important mission and, seeking out Achilles, they begged him to forget his grievances and join them with his forces for the morrow's fighting. But Achilles, who had really been most unfairly treated by Agamemnon, refused to do this. Downcast and mournful, the two messengers returned to the lines. The next day the Greeks fared even worse and Achilles, viewing the battle from the deck of one of his ships, sent his friend Patroclus to inquire for the wounded. In the tent of Nestor, Patroclus learned of the desperate situation of the Grecian forces, who, with all their most powerful fighters wounded or slain, were in danger of overwhelming defeat. Hurrying back to his chief, Patroclus begged Achilles to lend him his shining armor and let him lead his followers, the grim and terrible Myrmidons, back into the battle. As Achilles hesitated, the Trojans, spurred on by Hector, broke through the Greek ramparts, forced their way to the ships and in spite of determined resistance succeeded in firing one of the wooden vessels. This was more than even Achilles could bear. Unbuckling his armor and removing his gleaming helmet, he pressed them on Patroclus, urging him to hurry to take his untired legions and hasten to the aid of the Greeks. Only one condition was imposed by Achilles, that Patroclus avoid an encounter with Hector. Scarcely hearing, Patroclus donned the splendid armor leaped into the glittering chariot of his friend and, followed by the Myrmidons, rushed into the fight. The Trojans, deceived by the blazing armor of Achilles and thinking the doughty hero himself had returned to the fray, fled in confusion before the unexpected fury of the attack. Driving them from the ships, Patroclus, striking right and left, pursued Hector and the fleeing army to the very walls of Troy, disregarding the warning of Achilles. Here, wounded by the spear of a young Trojan, he turned his chariot, but it was already too late, and struck by the flying lance of Hector, he fell wounded to death upon the plain. The Greeks tried desperately to recover his body, but this was prevented by Hector. Stripping the armor of Achilles from the dead hero he buckled it on and the fighting continued with great clamor and bloodshed. Finally, Menelaus and Ajax succeeded. in wresting the body of Patroclus from the foe and bore it sadly back to the ships. When the news of Patroclus' death was brought to Achilles his grief was so great his groans and lamentations reached the ears of Thetis, his mother, in the depths of the sea. Hurrying to the side of her son, the immortal mother tried to comfort him. But swearing vengeance on Hector, Achilles declared he must at once rush back into the battle and seek out the insolent Trojan. As he was now without armor, Thetis persuaded him to wait till morning. Flying to the cloudy summit of Mount Olympus, Thetis sought out Vulcan, the Fire God. Moved by the tears of the lovely sea nymph, Vulcan forged in one night a new and glorious set of armor. Achilles, when Thetis brought him the gift from Vulcan next morning roused a little from his grief. Then, encased in the flashing armor of the Fire God, he strode toward the tents of his allies. Ending the long quarrel between himself and Agamemnon, he proposed that they immediately call their men and fall upon the Trojans. Rejoiced to have the great Hero again in their ranks, Ulysses begged him to wait till the weary warriors were rested, and reluctantly agreeing to the delay, Achilles returned to his tent to prepare for the coming battle. Of all the engagements in that long and bitter struggle this was the most spectacular and thrilling. Heartened by the return of Achilles, the Greek legions poured from the ships in a grim and glittering array. Above all the rest towered the immense fair-haired son of Thetis, the plumes of his crested helmet sweeping like a cloud of fire around his imperious head. And such were the rage and vigor of Achilles, none could withstand him. Followed by the combined armies of the Greeks, he swept the Trojans like sheep before him. King Priam, viewing the rout of his army from the walls, ordered the gates of the city to open to admit his fleeing warriors. All but Hector fled through the gates and with a resounding clang they swung shut. Hector, though urged by his parents and wife to fly from the wrath of Achilles boldly stayed to face his furious foe. Three times Achilles pursued Hector around the walls of Troy. Then Hector seizing his falchion, charged the mighty Grecian. But his sword bounced harmlessly off the Fire God's armor, and Hector himself was slain by the invincible spear of his opponent. Then, still beside himself with rage and grief, Achilles bound the body of the dead warrior to his chariot and dragged it back and forth before the walls of Troy, in sight of Hector's anguished parents and wife. There was now a pause in the dreadful hostilities for the burial of Patroclus and the other fallen heroes on both sides, and after the burial of Patroclus, Achilles relenting a little, returned the body of Hector. Notwithstanding the death of Hector, staunchest defender, the Trojan city still stubbornly held out against the Greeks. Calling in new allies, King Priam continued to repulse the attacks of the invaders. The bravest of these allies were the Amazons and until Penthesilea, their tall and beautiful leader, was slain by Achilles, these fierce warrior maidens wrought great havoc in the Greek lines. But great Achilles himself, doomed by the Gods to perish. before Troy, soon fulfilled his destiny. During the truce following the death of Hector, Achilles was much attracted to Polyxena, one of the daughters of King Priam, and demanded her hand in marriage. Following another truce between battles he met a delegation of Trojans in the Temple of Apollo, to arrange for the marriage and while in the temple was treacherously slain by Paris, who wounded him in the heel with an arrow. This, Paris knew, was the only vulnerable spot of the God-like warrior. When Achilles was an infant, Thetis had dipped him in the River Styx, and only the heel by which she held him escaped immersion in its magic waters. With Hector and Achilles, the Trojans and Greeks lost their most illustrious fighters. These two heroes should have been friends and companions in arms, but having been made enemies through the wicked act of Paris, both perished as always perish the brave for the sins of the weak. SYNOPSIS: Because Paris, son of King Priam of Troy, stole Helen, wife of Menelaus, King of Sparta, carrying her back to his father's Asian city, Menelaus declared war on King Priam. All the powerful rulers and warriors came to his assistance and, gathering their armies and ships, the Greeks set sail for Troy. But so strong were the walls of Troy and so brave its heroic defenders, even after a nine years' war the beleaguered city had not been taken nor Helen restored to her husband. So Hector, another sun of Priam, proposed that Paris and King Menelaus meet in single combat to end the war, the winner to receive fair Helen and the army of the winner to be declared victorious. To this Helen's husband eagerly agreed, and as the two heroes stepped forward the armies drew back to watch the contest. It soon became apparent that Menelaus would win, but just at the moment when victory was assured, Venus snatched Paris up in a cloud and returned him safely to Priam's castle. Howling with anger, the Greeks ended the truce, and the war started all over again. In the fierce battles that followed, Hector was slain by Achilles, and Achilles himself was killed by Paris. After the death of Hector and Achilles, sorrow and disaster pursued both the Greek and Trojan armies. Thetis, mother of Achilles, had decreed that his peerless armor be given to the bravest of the remaining heroes. So Ulysses and Ajax contended for the honor, and when the chieftains awarded the prize to Ulysses, Ajax killed himself from grief and vexation. Paris himself was killed soon after this by Machaon, Surgeon General of the Greek forces, but still the senseless struggle went on. Hearing that so long as the great statue of Minerva stood within the walls of the Trojan city it could not be taken, Ulysses and Diomedes disguised themselves, gained entrance into Troy and succeeded in carrying the huge statue back to the Greek camp. But even with the statue in their possession, victory eluded the weary Greeks. Finding force against the enemy unavailing, and advised by the wily Ulysses, the invaders finally resorted to a trick to overthrow the Trojans. By a word here and a word there, they let it be known that for a time, anyway, they had, abandoned the idea of capturing Troy and recovering Helen for her husband. They were, they declared, preparing to return to Greece, and to bear out this statement, part of the fleet was withdrawn and hidden behind a nearby and well wooded island. The Greeks who were left busied themselves with the construction of an enormous wooden horse, built sturdily of maple and pine and tall almost as the towers of Troy. This horse the Greeks pretended was an offering to the Goddess Minerva to insure them safety on the voyage home. But the wooden horse really contained in its hollow center room for a band of armed soldiers, and when the gigantic figure was completed, at darkest night and in deepest secrecy, a company of the most daring Greeks concealed themselves within. Bidding their comrades farewell and good luck in the dangerous plan they were attempting, the remaining warriors boarded the ships and sailed away, but not too far away, as you can well imagine. Thinking their enemies had gone and the siege of the city had really been abandoned, the subjects of King Priam opened the gates and issued forth to inspect the camp and deserted plain. The great horse, looming up like a mountain on the trampled shore, was the only thing the invaders had left behind, and it caused no end of wonder and speculation on the part of the Trojans. Some of the older and wiser of the King's counselors suggested that they push the intrusive monster into the sea or apply the torch, thus destroying every evidence and memory of their fierce and persistent foes. As the question was being debated and the hidden soldiers inside the great horse were awaiting in fearful anxiety for the next move, Laocoon, another of Priam's sons, hurried down from the capitol. "Wretched countrymen, what is this desperate folly?" he demanded. "Do you believe the enemy gone, or think you any gifts of the Greeks can be free of danger and deceit? Either the Greeks lie within the wood or it is an engine framed against our walls. Trojans, put no faith in this horse! Whatever it, be, I dread the Greeks even when they bring gifts." With these words, Laocoon sent his huge spear hurtling against the monster's side. The arms of the hidden warriors rattled at the impact, and the spear stuck quivering in the wood. But so sure were the infatuated Trojans that their enemies had really sailed away, they gave no heed to the ominous sounds. They might have listened more carefully to the words of Laocoon, had not a band of shepherds appeared at that moment, dragging after them a frightened Greek. Apparently he had been left behind, and so dejected and forlorn was his appearance, King Priam took pity on the fugitive and bade him explain why he had been deserted by his comrades. This the fellow was willing enough to do, he being the most important factor in the clever scheme of Ulysses. With carefully chosen words of flattery and a sad and utterly untrue story of his own persecution, the Greek, whose real name was Sinon, gained the sympathy and confidence of his captors. Explaining that he had been chosen by Calchas, the seer, as a sacrifice to the Gods and was to be put to death to insure the Greeks a safe journey home, he told how he had escaped and hidden himself in a gloomy marsh until the ships had departed. With deep interest, Priam listened to Sinon's story and then asked him for what purpose his countrymen had constructed the huge wooden horse now standing so solemnly on the shore. Sinon, delighted to further the plans of the Greeks, told the king that the great horse was a tribute to Minerva to appease the goddess for the vexation she felt because they had stolen her statue from Troy. And, furthermore, he said, Calchas had prophesied that if the horse were destroyed by the Trojans, victory would certainly crown the Grecian hosts, who would return at some future day and fall upon them in an unexpected moment. If, on the other hand, the horse were placed safely within the walled city, the ancient Asian capital, its king and its armies would conquer all comers and proceed from victory to victory its all present and future wars. With what concern Sinon must have waited to see how the Trojans would receive this tale! So much depended on their believing him. His own and his comrades' lives hung in the balance, and, deceitful as he was, one cannot help but admire his courage in playing the dangerous part of a spy for the Greeks. As Priam debated the wisdom of conveying the horse into the city, two monstrous serpents rose out of the sea and rushed furiously ashore. Winding themselves about Laocoon and his two small sons, they crushed the three to an instant and terrible death. In fright and terror the Trojans witnessed this dire happening and, now thoroughly convinced that the gods had thus punished Laocoon for casting a spear at the sacred horse, they made hasty preparations to move it into Troy. Tying a hempen rope round its neck, slipping wheels under the clumsy feet, they made a wide breach in the walls and, by dint of pulling and pushing and with the aid of the soldiery and citizenry, they dragged the monster into the heart of the capital. Rejoicing crowds followed the procession, tossing flowers in its path and, convinced that the long war was over, everyone joined in a jubilant celebration. Wearily, at last, the merrymakers returned to their homes, the city grew silent and the moon sailed pensively and for the last time above those bastioned walls. Now came the moment for which the impatient Greeks in the hollowed body of the horse had tensely waited. Sinon, first letting the fleet know by well-placed signal fires that their plan had succeeded, next released the men hiding in the wooden horse. Down the stout rope to the ground slid Ulysses, the wily Ithacan; Menelaus, Helen's husband; Thessandrus, Sthenelus, mightiest of the chieftains; then Athamas, Thoas and Neoptolemus, son of Achilles, and Machaon and Epeus, who, with Ulysses, had planned the daring trick. Now, alas for Troy and its valiant defenders! Alas for the beleaguered city that for ten stubborn years had withstood the battering of the Greeks and turned back every tumultuous attack from its impregnable walls. Overcome by a ruse, it was conquered in one fateful hour. Beating down the sentinels, Ulysses and his comrades opened the gates, and the horde of warriors that had landed quietly from the ships poured in, wave after wave, over the defenseless city, destroying with fire and sword the magnificent capital of Priam. In the fierce hand-to-hand encounters many of the Greeks perished with the conquered. But, unprepared and hopelessly outnumbered, the Trojans, even as they pushed the towers and battlements of their palaces and dwellings upon the heads of the grim invaders, were killed, taken captive or driven into the hills. Priam, the brave and trembling old king, donned his armor and valiantly tried to defend his queen and young sons, but was brutally slain by Neoptolemus, son of Achilles. Aeneas, another of the Trojan princes, fought gallantly, trying to rally the terrified soldiery. But as the games mounted and the conflict grew more and more hopeless, he managed to escape from the burning town, bearing upon his back his aged father and followed by a band of refugees. The descendants of this same Aeneas later founded the Empire of Rome. The wooden horse, its wicked purpose accomplished, sank down, a crackling heap of embers, as the destroying flames leaped hungrily over the doomed and ruined town. Thus, in victory for the Greeks, ended the thrilling contest of the heroes before Troy. Helen, cause of all the sorrow and bloodshed, journeyed with her husband back to Sparta, where they reigned for many years in regal splendor. Ulysses, after innumerable catastrophes and ten years' wandering, came at last to Ithaca, where his wife Penelope patiently awaited his return. And so in time came all the other surviving warriors to their native shores. He entered the ancient town? The Trojans - what a pity! Of Troy. But the walls held fast and true. To see what course they should now pursue. For some of the bravest men to hide. For some hid fast in the horse of wood. Had gone. Their curiosity grows. And drag in the horse with a lusty shout. The GRECIAN army! The city's taken. The story of the Greeks' resource! Originally published in the Philadelphia Public Ledger, January 23, 1916. 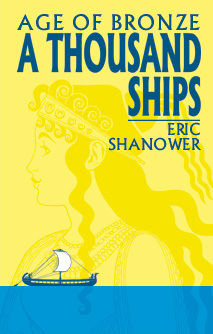 For a full-length comics art retelling of the Trojan War legend, don't miss Eric Shanower's award-winning Age of Bronze. Copyright © 2001, 2003 David Maxine and Eric Shanower. All rights reserved.